The other day I decided I had to start playing the piano again. For a couple of months I had not so much as put my hands on the keyboard. It felt terrible not to be playing because for so long I had worked pretty hard on the piano, you know? And I hate to let it all go. Anyway, on Sunday night I think it was, I walked past the old Steinway in the living room and it was just sitting there forlornly all quiet with nobody playing it. Howard does a lot of his playing at Big Blue. It felt like forever since anyone had played this piano. And I remembered when my world revolved around it. So I felt for the piano, sitting there like this big silent animal. And I sat down. The first thing I did was play this Schubert Impromptu that I could play in my sleep pretty much. I thought I could start with that. Here is Al Brendel playing that piece. I always have to say "Al Brendel" because that is how Earl Wild wrote it in his book. Howard came in while I was playing the Schubert and he stood there and listened and told me it sounded great! Not only that but he took that picture of me up above, playing the piano. I am going to keep it to commemorate the occasion. ... how Beethoven gives you this melody and then he doubles up the notes, then he takes it in threes, and then in fours. The part where he goes into fours is my favorite part. And, more importantly than what I felt about it, the music was sitting right there. I started playing the Beethoven and then something funny happened. I wound up playing the whole sonata! It is not as if it was the greatest but it was way better than I had thought it would be. And this one part that used to give me problems mysteriously no longer gave me problems. I could not believe that. I stopped and checked myself to make sure I was nailing all the notes. Yep, I was. Thank you God! Thank you Beethoven! Today I felt different because I had played Beethoven's "Appassionata" the night before. I mean, already I am different because I am the authorized biographer of Leonard Pennario. But having played the "Appassionata" the night before added that other dimension. 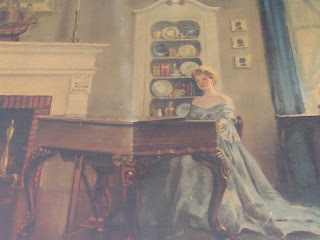 The painting on your site of the lady in the blue off shoulder dress playing the piano: what can you tell me about this. My mother has had that hanging in her home for many years. I'm sitting face the keyboard to type this comment.